When Kara Westfall was five years old, her mother was convicted of the worst of all crimes: witchcraft. Years later, Kara and her little brother, Taff, are still shunned by the people of their village, who believe that nothing is more evil than magic . . . except, perhaps, the mysterious forest that covers nearly the entire island. It has many names, this place. Sometimes it is called the Dark Wood, or Sordyr’s Realm. But mostly it’s called the Thickety. The villagers live in fear of the Thickety and the terrible creatures that live there. But when an unusual bird lures Kara into the forbidden forest, she discovers a strange book with unspeakable powers. A book that might have belonged to her mother. And that is just the beginning of the story. 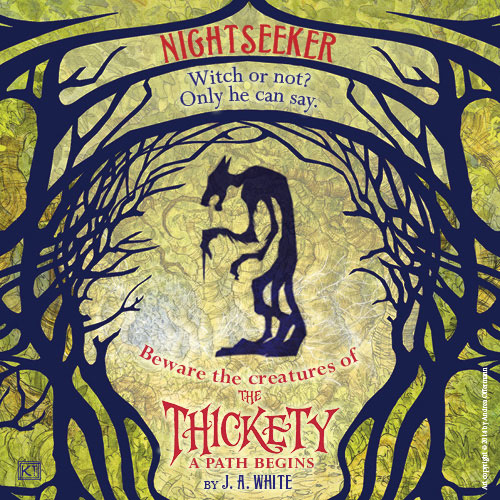 The Thickety: A Path Begins is the start of a thrilling and spellbinding tale about a girl, the Thickety, and the power of magic. J. A. White lives in New Jersey with his wife, three sons, and a hamster named Ophelia that doesn’t like him very much. When he’s not making up stories, he teaches a bunch of kids how to make up stories (along with math and science and other important stuff). He wishes dragons were real, because it would be a much cooler way to get to work.